To participate in the 340B Drug Program, eligible organizations and covered entities must register and be enrolled with the 340B program and comply with all program requirements. The main goal of this course is to provide information on the subtleties of the 340B program and how it can impact revenues at a Federally Qualified Health Center (FQHC) and FQHC Look-Alike programs. This course covers all of the nuances within the program, including duplicate discounting, patient definitions, and more. You also will learn how these issues can impact the fiscal performance of a Health Center. Using interactive exercises and case vignettes, you will learn how to apply your knowledge of these requirements in your own setting. 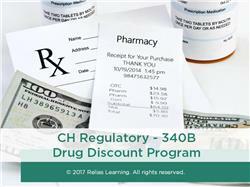 Identify three types of entities eligible to enroll in the 340B program. Name at least two requirements needed for people served to use the 340B program. Describe three attributes of 340B compliance that are vital to the self-audit process.